South America specialists, Tucan Travel, have launched four group tours combining the highlights of mainland South America along with a four night cruise through the Galapagos Islands. 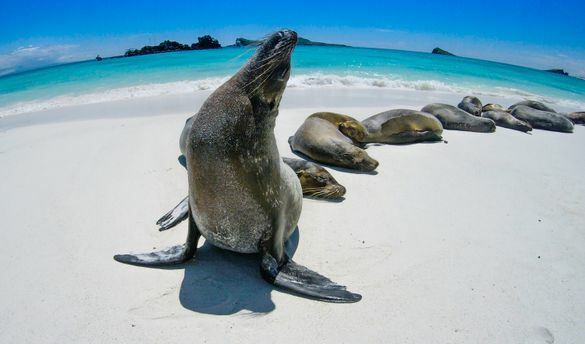 The adventure travel tour operator have always been known for their modular tours, where customers have been able to combine itineraries together, however this is the first time where they have added the Galapagos Islands to itineraries in mainland South America. The longest tour, Iconic South America is 41 days long and travels from Cartagena, Colombia through Ecuador, Peru, Bolivia, Chile and Argentina before ending in Rio de Janeiro. An excellent two week tour combining the Galapagos with the highlights of Peru. Included: 4 day Galapagos Cruise, 2 day Amazon Jungle excursion, train to Machu Picchu with entrance and guided tour, guided tour of the Sacred Valley, 7 nights hotel, 4 nights boat, 2 night eco jungle lodge, all breakfasts, 6 lunches, 6 dinners, all transport on tour, tour leader and/or naturalist guide. Combine the Galapagos cruise with highlights of Peru including the Inca Trail Trek and Lake Titicaca. Included: 4 day Galapagos Cruise, 2 day Amazon Jungle excursion, Inca Trail Trek to Machu Picchu with entrance and guided tour (all meals included while on trek), guided tour of the Sacred Valley, Quito City Tour, Ballestas Island visit, Huacachina Oasis Visit, guided tour of Colca Canyon, Lake Titicaca Day Trip, all breakfasts, 10 lunches, 9 dinners, all transport on tour, tour leader and/or naturalist guide. Combine an in depth Colombia tour with the Galapagos Islands. Included: 4 day Galapagos Cruise, Medellin City Tour, Overnight coffee excursion and guided tour, Cocora Valley guided tour, Quito City Tour, all breakfasts, 4 lunches, 4 dinners, all transport on tour, all accommodation, tour leader and/or naturalist guide. See it all on this ultimate South America Adventure. Combine the Galapagos with highlights of Peru, Ecuador, Bolivia, Argentina and Brazil. Tick off Machu Picchu, Uyuni Salt Flats and Iguazu falls. Included: 4 day Galapagos Cruise, Medellin City Tour, Overnight coffee excursion and guided tour, Cocora Valley guided tour, Quito City Tour, Iguazu Falls, train to Machu Picchu with entrance and guided tour, guided tour of the Sacred Valley, day trip to Lake Titicaca, Argentinian winery tours, all breakfasts, 4 lunches, 4 dinners, all transport on tour, all accommodation, tour leader and/or naturalist guide. Tucan Travel have been operating tours in South America since 1987. They have offices in London, Sydney, Toronto, Lima and Cusco. They have recently won the best small holiday company to South & Central America in the British Travel Awards as well as South America’s Leading Green Operator in the World Travel Awards.